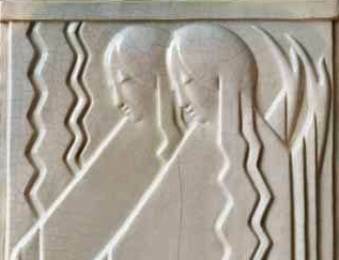 May Hamilton de Causse, “Two Women” plaque, circa 1934. Photo by Susan Einstein. Along with exhibits of Western landscapes and Hopi Katsina dolls at the Autry Center in Griffith Park, there’s a terrific show of 46 pioneering female artists: California’s Designing Women (1896-1986). It’s filled with 240 examples of elegant arts & crafts ceramics, sleek mid-century modern furnishings, chunky lucite jewelry, wild textiles, and dramatic graphics. The beautiful works by Ray Eames, Beatrice Wood, Deborah Sussman, and dozens of other unsung heroines, display close to a century of both fine and commericial art. It’s on through January 6, 2013. One stunning piece that seems to fit the setting, was the “Rabbit Hunt,” a shimmering silver and gold leaf screen by Esther Bruton. It’s all organized by the Museum of California Design, and could easily have been part of The Getty’s Pacific Standard Time, though many of these artists were included in the multi-museum extravaganza launched last year. Though I don’t often think of going to The Autry, it often offers great shows like “The Art of Native American Basketry” or the exhibition featuring fantastic Polish poster art of American Western movies from the book, Western Amerykanski. Reminds me of the Fowler Museum of Cultural History at UCLA. Worth a visit. This entry was posted in Art and Design and tagged design, Los Angeles, women artists. Bookmark the permalink.